The cherry season and a bird that loves to swim in such a vinaigrette!. 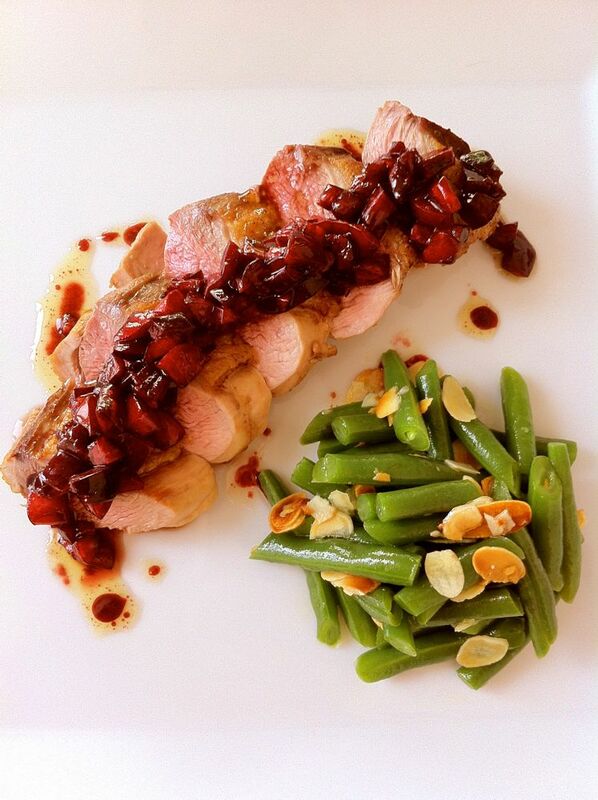 Duck with cherry sauce has always been a classic French dish. But while we're in summer, let's change the hot sauce for a fruity and refreshing vinaigrette . Wash, debone and chop the cherries with a knife. Put everything in a bowl and season with 1 tablespoon of balsamic vinegar and 3 tbsp extra virgin olive oil. The vinaigrette may already be good like this. Indeed, this is already an excellent condiment for most uses (salads, cheeses, etc..). But to bring even more flavor, we deglaze the pan where we cooked our duck breasts. 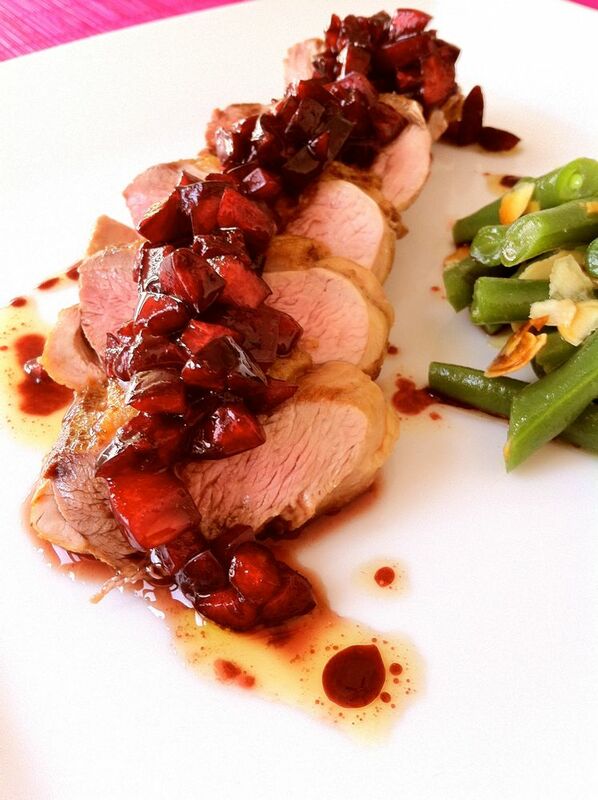 Take the duck breast and with a knife score the skin side (without touching the meat) forming diamond shapes. Season and put on a cold frying pan skin side down without adding any oil. Turn on and leave it at medium-low heat for about 5 min.. When golden brown, turn it over and let another 2 min. aprox. Touch it in the center to understand the cooking. If too soft is undercooked, if hard is overcooked. So look for a middle point. 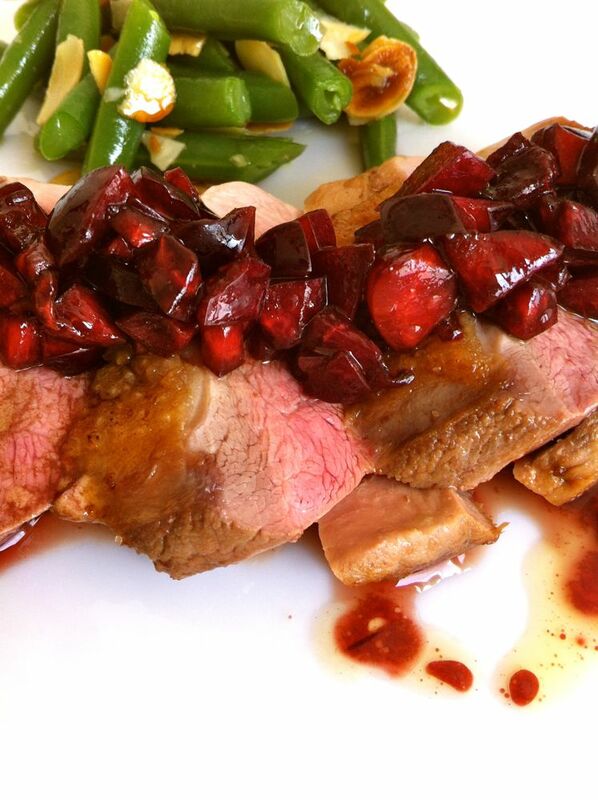 The optimum cooking point for a duck breast is pink/midium (between cooked and rare). Very important to leave the duck breast to rest for 10 min. before cutting. In this way the fiber relaxes and absorbs its juices. The color will be uniform and even the temperature. Deglaze means to dilute the protein elements caramelized and stuck in the bottom of a pot (usually after cooking meat). By adding liquid (wine, broth or water) to detach these elements and form a sauce. A tasty sauce which will then accompany the meat itself. So place the breast aside in a dish, discard the excess fat and the pan back on fire without washing. Add finely chopped shallots, let it cook, add a splash of port wine and when just evaporated the alcohol, put the sauce in the bowl with the cherries and chill. Cut the breast after resting and serve with the vinaigrette. As garnish today I did a salad of green beans with toasted almonds.